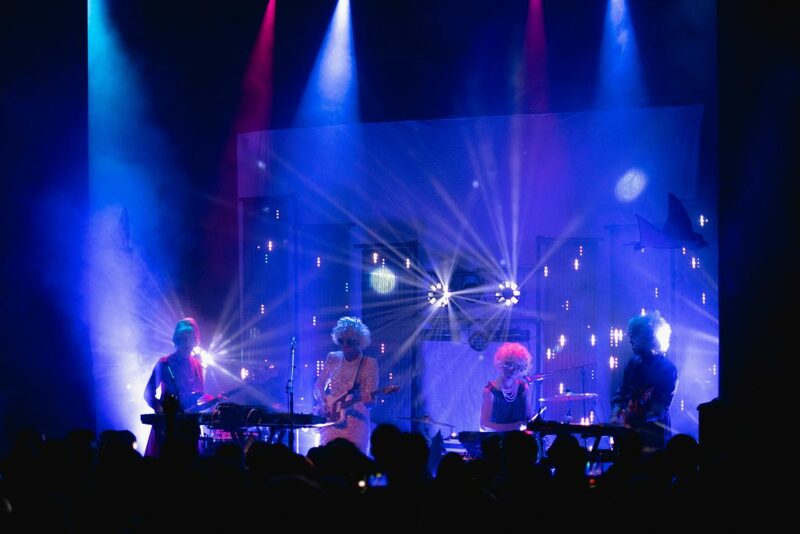 The Portland-based indie-pop-tronica-psych-rock band STRFKR had the stage to themselves Tuesday night at Lincoln Hall. Doors opened at 7, and the band didn’t come on until past 8:30, so I had plenty of time to take in their elaborate setup. 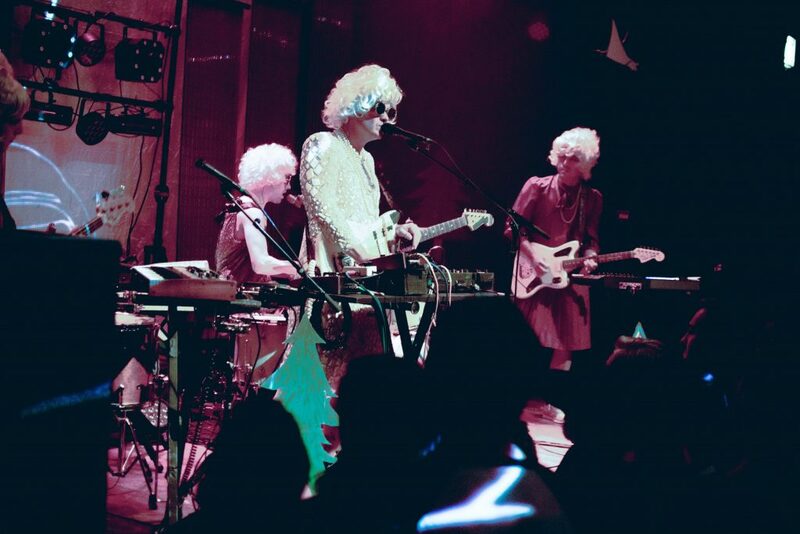 The stage featured multiple guitars, synths, drum pads, and effects pedals intricately woven throughout cardboard cutouts of psychedelic stingrays floating eerily above foot-tall pine trees and the album art for their 2009 LP, Jupiter. A series of vertical LED panels displayed a dynamic, galactic landscape, emulating a space flight at warp speed. 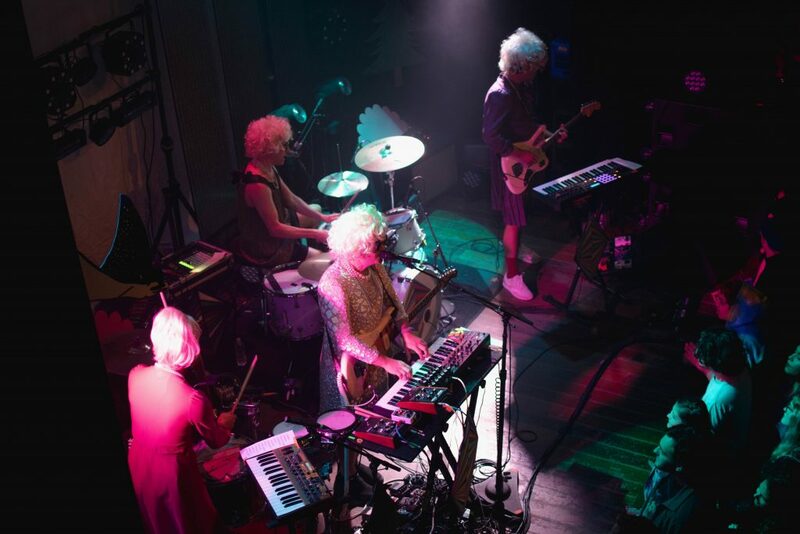 The four band members took the stage in full drag, sporting silver wigs to match their patchwork and sequin lined dresses. The scene looked like a casting call for the role of Grandma in a Little Red Riding Hood stage adaptation with an N2O leak somewhere in the building. A projector stationed in the balcony projected trippy visuals over the entire set. Think Adventure Time imagery, but on acid—well, more acid. I’m sure some of you are familiar with the band Crumb…the art style was reminiscent of the album art from their Locket EP, with hand-drawn images and poppy, playful color schemes. The band calmly thanked the crowd for supporting them throughout 10 years of bandhood and claimed to be expecting at least 10 more. As they began to play, the crowd seemed into it, but far less dancey than I had anticipated them to be given the upbeat, pulsing nature of the music. They roared for the big hits but only mumbled and shuffled along to some of the deeper cuts. This didn’t stop STRFKR from putting on a hell of a show, complete with lasers, a disco ball, and a confetti cannon. The band took an intermission about halfway through the set, giving me time to check out the fully stocked merch table which was very organized and well-done—a delicacy in laidback, bar-style venues such as Lincoln Hall. All in all, it was a great show. The set list spanned their entire musical career, opening with a track from their first album ever, Starfucker (2007), and by the end of the night they had dipped a toe into every official release in their discography. Some of the apparent crowd favorites included “Rawnald Gregory Erickson the Second,” “Golden Light,” and “Tape Machine.” The music was energetic, perfectly mixed, and just the right dose of nostalgia for a moody Tuesday night at the beginning of fall quarter. The band played back-to-back nights at Lincoln Hall, but I was only in attendance for the first of the two shows. There is no doubt in my mind that they rocked it out to a packed house both nights, playing to new and old fans alike, spreading infectious love and all-around good vibes…generally doing what they do! STRFKR is clearly a monolithic name in their genre for a reason, and perhaps even a bucket list must-see. If you haven’t made it to one of their live shows yet, I would highly suggest that you do.